The strength of our community rests on the commitment and dedication of individuals who work to improve the lives of others. The Jewish Federation of Madison proudly recognizes outstanding individuals who, by their achievements, exemplify the qualities we hold dear. 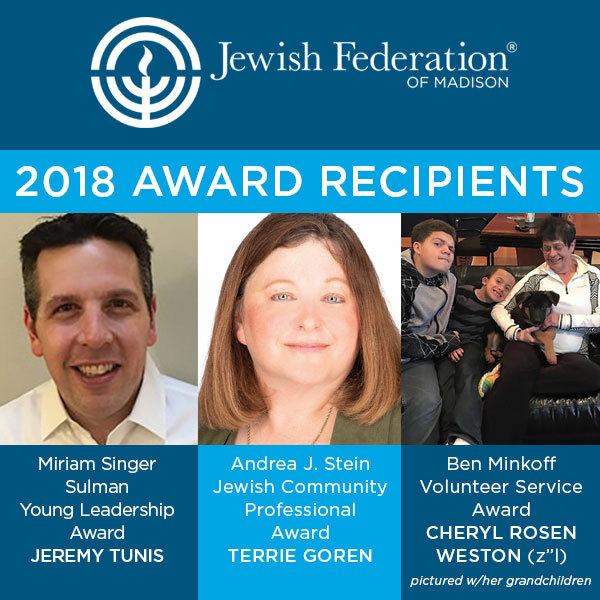 The Miriam Singer Sulman Young Leadership award, the Andrea J. Stein Jewish Community Professional award, and the Ben Minkoff Volunteer Service award will be presented to this year’s deserving winners at the JFM Annual Meeting on November 18, 2018. The Jewish Federation of Madison has a long-standing tradition of recognizing future leadership. In 1975, the Miriam Singer Sulman Young Leadership Award was established by her parents Isadore and Ida Singer (z”l) in memory of their much admired and dynamic young JFM leader. This award not only recognizes the achievements and future potential for leadership but enables the recipient to attend the Jewish Federation of North America General Assembly through an endowment fund established by her parents. We are fortunate that Jeremy Tunis is this year’s young leadership award recipient. He will attend the JFNA General Assembly in Tel Aviv between October 22-24. Jeremy has been involved in many aspects of the Federation since he arrived in Madison with his wife, Dr. Michelle Poliak-Tunis and their two children Jaime and Lola. Jeremy is on the Board of Directors of JFM, and has been particularly involved in fundraising for Gan HaYeled, and is the co-chair of this year’s Tzedakah Campaign. Jeremy is an attorney who manages a Madison-based public-affairs, crisis communications, grassroots and legislative advocacy and fundraising consultant business. The award will be presented by last year’s recipient, Dr. Jesse Sondel. The 2018 Ben Minkoff Volunteer Service Award will be presented posthumously to Cheryl Rosen Weston for her years of devoted service to the Madison Jewish community. The late Cheryl Rosen Weston was chosen for this honor because of her many years of devoted involvement in the Jewish community. Cheryl served on the Board of Directors of the Federation and served as president of the Board of Jewish Social Services and UW-Hillel. Cheryl was an attorney and co-founder of Cullen, Weston, Pines and Bach, full-time faculty member of the UW-School of Law and was CEO of the Douglas Stewart Company. Cheryl was particularly committed to protecting the human rights and dignity of all individuals. Cheryl left large legacy gifts to the Jewish community which will sustain her involvement and influence for many years to come. The Ben Minkoff Volunteer Service Award to Cheryl will be accepted by Cheryl’s daughter Samantha Weston. The 2018 Andrea J. Stein Jewish Community Professional Award is being presented to Terrie Goren, Executive Director of Temple Beth El. The Andrea J. Stein Jewish Community Professional Award was created to recognize a Jewish community professional that promotes Jewish community outreach, engagement and action that best serves Klal Yisrael. Terrie was chosen not only for her work at Temple Beth El but also for her work as the Executive Director of Jewish Social Services and the volunteer leadership of the Jewish Burial Association of Madison. Terrie has also served locally as the director of the Madison Public Library Foundation. Terrie is married to Len and is also the mother of Adam and Jamie. Terrie is a Certified Fundraising Executive and has been an active member of the Association of Fundraising Professionals.